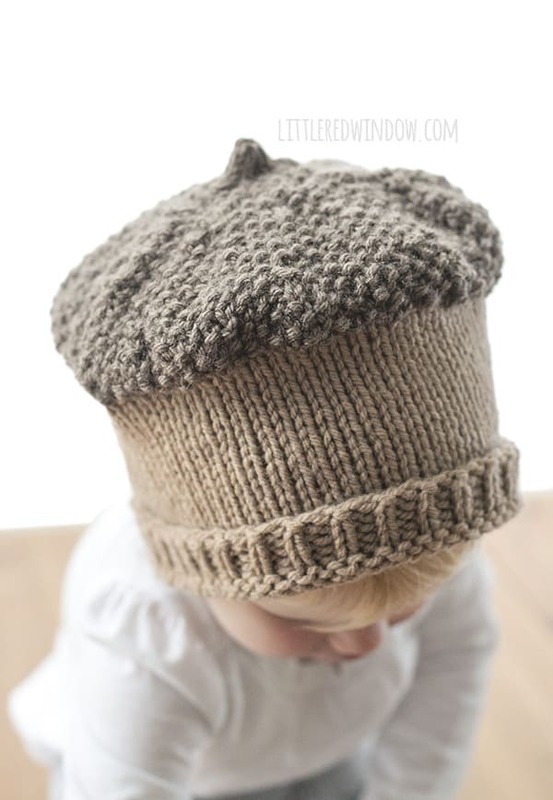 This adorable little acorn hat knitting pattern is just perfect for a crisp, cool fall day! 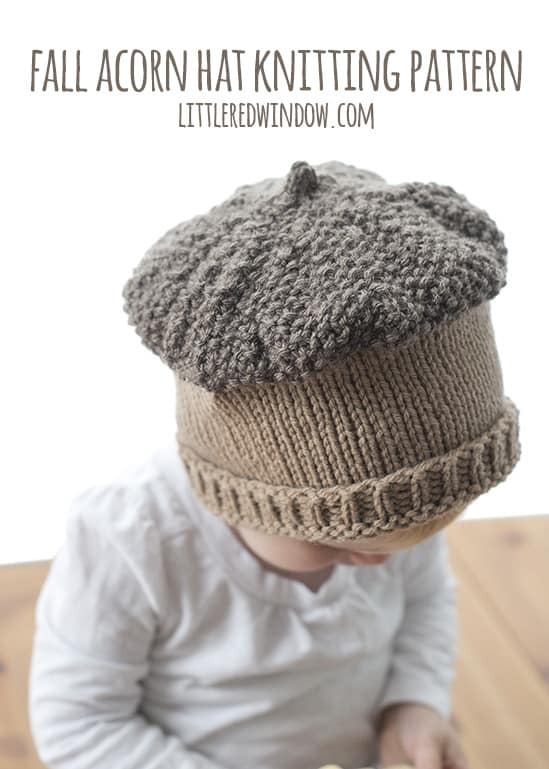 So…are you guys thinking I’m nuts for making this cute fall hat? Was that acorny pun? Should I keep going? No, that’s enough? Ok! Well, back to the business at hand. I was brainstorming fall hat ideas and thought an acorn hat would be really adorable. Acorns are such a pretty shape and they’re just SO autumn that I think it makes for the perfect hat that you can wear from August straight through Thanksgiving! I especially love how the seed stitch acorn top came out. That was, ahem, interesting, to figure how to do the decrease with that pattern but I love you guys so I toughed it out. You’re welcome! 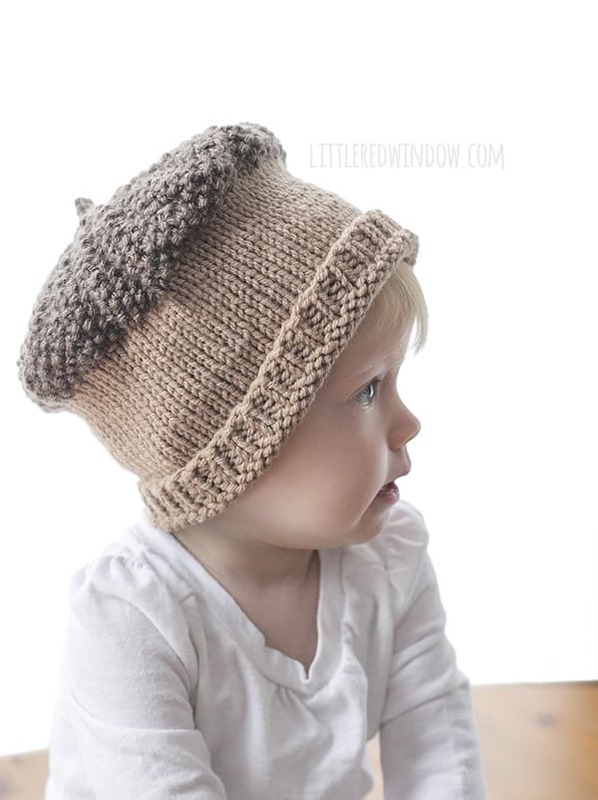 If you make an acorn hat for your baby with this knitting pattern, please make sure you share your project with me on Ravelry! PLEASE NOTE: Baby V is wearing the 2T+ size in these photos and it’s a little big which is why the brim is folded up, the regular pattern does not include a folded brim. Using long-tail cast on, cast on 72 stitches onto your circular needles with the tan yarn color. Join to knit in the round and k1, p1 in a rib stitch for 4 rounds. Knit all stitches until the hat is 5 inches long. Then switch to brown yarn and being decrease. Round 33: k2tog until last stitch and then k1. Cut yarn, pull through loops to close and weave in ends. 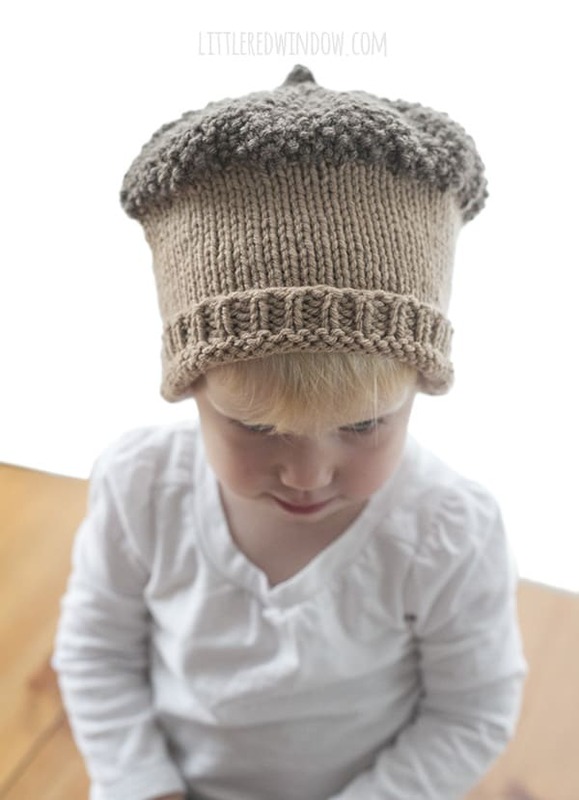 Love your acorn hat. 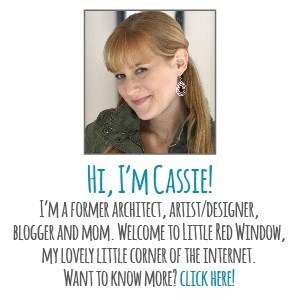 Can you give approx yardage needed for different sizes? Hi! I have not had anyone else tell me they had this problem. The thing is, because you’re decreasing, the seed stitch won’t stay exactly perfect. In row 9 there will be two purl stitches in a row in each repeat. (And this will also happen in other rounds.) But as you decrease I’ve done my best to spread those spots out to make them less noticeable. When you look at the overall hat these spots shouldn’t be too terribly obvious. There really is no perfect way to decrease with seed stitch and keep the pattern up perfectly unless you so double decreases. But that changes the shape of the hat in a way that I didn’t want. Hope that helps! Happy Knitting!